The 'Child's Play' series has paved a rocky road in its time, we had a horror franchise that turned to comedy quicker than any other. However, the comedy approach seemed to work a lot more in favour for this specific franchise, the premise of a killer doll itself is quite 'out there', so adding an element of dark humour is not a long-shot and can work in its favour, 'Bride of Chucky' being a clear example and my personal favourite of the whole series. However, as time progressed, we saw the comedy become more and more out of hand, it was less Chucky spurting one-liners as he dispatched his victims and more running a Britney Spears parody off the road in the 2004 sequel, 'Seed of Chucky'. That specific entry effectively killed the entire franchise, despite it being Don Mancini's first attempt at directing a motion picture, Mancini being the creator of the original 'Child's Play' and being involved in the entire series. It's been nearly ten years, but finally, like some other horror icons, the doll himself has been resurrected for another stab at some slasher fun. “Sorry Jack, Chucky's back!”. I believe this was the tagline for 'Child's Play 2'. Upon viewing the latest sequel in the 'Child's Play' franchise (or more modernly known as the 'Chucky' series), I will just tell you right here that the same applies. Chucky is back and just as fun as we remember him. I'll just end the speculation and confusion here, this IS a sequel. It's not a prequel and it does not take place in-between other sequels, this is Child's Play 6, it's all explained throughout the course of the plot. Right, now that's out of the way, we can continue. 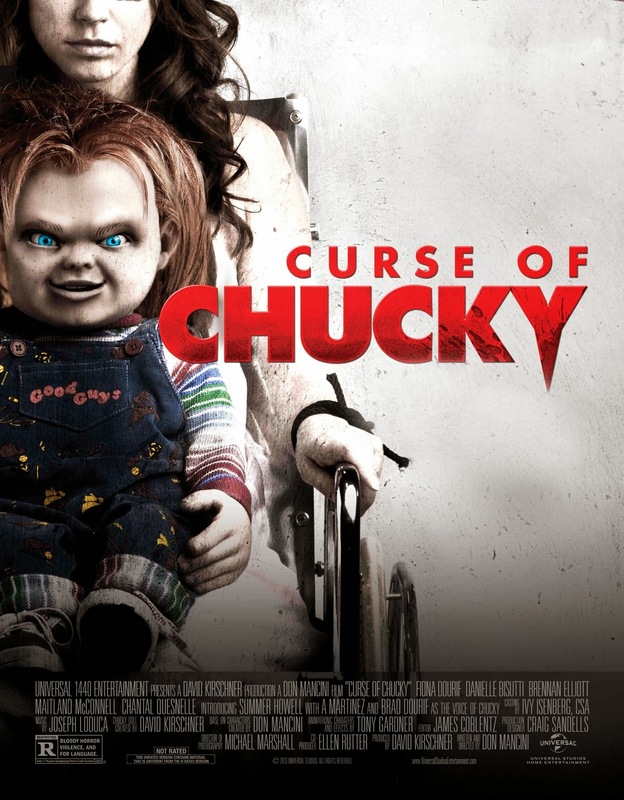 Mancini has definitely upped his game ten-fold with 'Curse of Chucky', although the film is straight to video, it looks better than a lot of theatrically released horror films at the moment. The film is shot with a fantastically dark colour scheme and effectively uses all the dark corners and shadows to its advantage. Lingering shots and clever editing help to create some truly unique sequences. Taking place in a large, hammer horror-like mansion, there was a lot of room for Mancini to play around with. For this being his second experience at directing, the comparison is unrecognisable, he has certainly done his homework and know what works for the horror genre. There is even a little homage to John Carpenter's 'Halloween' in one particular shot. The cast is great and the plot really has some twists and turns that I did not see coming, some involving Charles Lee Ray before he was more famously known as the psychotic three foot tall ginger killing machine. Brad Dourif once again delivers a fantastic vocal performance as well as physically portraying Charles in some flashback sequences. Brad Dourif's daughter, Fiona Dourif, plays the lead role of Nica who is a paraplegic. Like her dad, she delivers a fantastic performance and I think we could consider her the first disabled scream queen, her condition is not used simply to increase tension or make you feel sorry for her, but rather having some genuine plot establishments that expand upon scenes. She may be in a wheelchair but she can deliver a mean backhand. One thing we should note here is that this sequel returns to the tension of the original Child's Play. I can't exactly call it 'scary', I've never been scared by Chucky, but the film does try and up the tense atmosphere continuously until it reaches a climax. Chucky doesn't come out cracking jokes within the first five minutes, a long time goes by before he even says a single word., he's a lot more recognisable as his original counterpart than the wise-cracking doll we came to know. One scene involving rat poison in one characters food at a dinner gathering keeps us guessing with continuously built tension until the very end of the scene. The kills themselves are for the most part quite inventive, but they always have been in this series. It's not been the likes of Friday The 13th where a lot of it is just hack and slash, Chucky likes to play with his kills in a creative sense. Gore hounds might feel a little underwhelmed with this entry, but the brutality of some of the kill scenes makes up for that, if it's any consolation to those of you who enjoy a bloodbath. It's not all sunshine and good guys however, there are a few problems with this film and most of them fall on the technical side of things. I understand that this is straight to DVD, but it's very clear that are at least three Chucky dolls used in the filming of 'Curse', each of them looks significantly different from the others, so when they switch the dolls mid-scene to show a facial change within Chucky, it can be a little jarring and take you out of the moment. You will all be glad to hear that CGI isn't overly present here but when it does appear it feels very out of place. We get very used to seeing a practical doll moving around with puppetry, so when it switches to the odd CGI shot, it feels even more out of place, I feel that a lot of the CG shots in this film could have been avoided with some clever positioning of the camera, we don't need to see Chucky walk down a flight of stairs with some bad rendering, a mid-shot of his upper torso would've worked just as well, in my opinion. That being said, I can really appreciate what was done here, to return Chucky back to his roots while still keeping some of the popular aspects of the later sequels. A brave move and one that hopefully has restored some life into the franchise, I'd love to see it continue from here. There are a lot of cameos, nods and tie-ins to previous films here, although one sequence does mess with the origins of the first film slightly with the lack of any of Charles' accomplices. At the end of the day, if you're wanting to sit back and see Chucky do his thing, you will be very happy with this instalment. Hopefully this is not the last time we'll see the Chuckster and I hope that some other franchises that have long overdue sequels get wind of how successful the straight to DVD route can be. Make sure you watch until the very end of the credits. 4 'Good Guy' dolls out of 5. Chucky is undoubtedly one of the most beloved horror icons of the past thirty years. When ‘Child’s Play’ first hit theaters back in 1988, it was frightening and atmospheric, and it called to mind some of the things that terrify many people – demon worship, dolls, and murder. As Chucky’s rampage continued, however, the story became less scary and, like Freddy Krueger, everyone’s favorite Good Guy eventually became something to laugh at rather than something that kept audiences up long after the movie was over. Rumors of a ‘Child’s Play’ reboot continue to turn up from time to time but in the meanwhile, fans were given ‘Curse of Chucky’ to whet their appetite a bit. If this movie is any indication of where the reboot will take them, however, fans may soon forget why they loved this iconic doll in the first place. ‘Curse of Chucky’ makes a smart move by all but ignoring the previous two installments of the franchise and tells a completely new story with all new characters. Nica (played by Fiona Dourif), who is wheelchair bound, and an overprotective mother. Early in the movie audiences see that Nica really has no control of her life and bends to the will of her mother very easily. One day, a mysterious package arrives that contains that old friend til the end, Chucky, and soon, Nica is left motherless. The true repercussion of her death is that the home in which she and Nica have been living in has been left to both Nica and her horrible sister, Barb (Danielle Bisutti). Barb decides to bring her husband Ian, young daughter Alice, and new nanny Jill to the home to convince Nica to sell. In a predictable course of events, Alice finds Chucky and the body count begins to rise. There are plenty of problems with this movie from beginning to end. Firstly, the opening 20-30 minutes are very slow and the actors seem as if they have only just read the script and are now trying to play out scenes that are completely unfamiliar to them. All of the actors stumbled during the first third but if there was one actor who came close to natural, it was Brennan Elliot as Ian. He plays the charming husband and loving father very well and he is believable. Once they hit their stride, the other actors did begin to truly play the game, and luckily the story does pick up, but by then, it is almost too late. That being said, Danielle Bisutti is absolutely easy to hate as the bitchy sister who just wants the money. She cares nothing about anyone or anything, other than money and possibly her lover. Her attitude towards her sister and, by extension, disabled people in general is positively horrid and audiences will no doubt root for her to die; the real reason that anyone watches Chucky movies. Chucky and fans will undoubtedly grow restless waiting for him to unleash his special brand of murder. Once it happens though, there are even more problems. Anyone who has seen the trailers has seen the horrible job that the filmmakers have done with the creation of the character for this installment. This is truly disappointing, considering how easy it would have been to stick with the prop dolls from the original movies rather than trying to create something new with CGI. Actually, audiences will even notice scenes that seem as if it is using horrible CGI only to realize that the prop being used is simply dreadful, and vice versa. The new face is explained a bit towards the end but it still seemed unnecessary to change such an iconic character so drastically. Yet another problem with the movie lies in the motive behind Chucky’s killings. In the previous installments, there seemed to be some reason for Chucky to kill, even those reasons can only be seen through the eyes of a sociopath. In this film, however, the killings are seemingly random and it is only within the last few minutes that the audience is let in on the secret. The problem is that by that time, audiences don’t really care anymore and if they did, the motive is truly weak, especially to those who are familiar with the mythology behind the character. It isn’t all bad, however. Chucky is still Chucky, even with the face lift; his murders are still committed with his usual flair. Once the ball gets rolling, it keeps going through until the end and there are only a few slow moments. Not to mention, it is still great to see that creepy little doll stalking so many people who are just too stupid to ask themselves why a doll isn’t in the same spot they left it two minutes ago. Charles Lee Ray was a heartless killer who worshipped the devil so well that he was able to put his soul into an intimate object; a killer so bent on his own survival that he was willing to kill a child that he had never even met in order to live on; a killer so obsessed that even once he no longer needed his original victim, he still pursued him. While the ghost of Ray may be in the ‘Curse of Chucky’, his soul was nowhere near it. Fans may still hold out hope for a ‘Child’s Play’ reboot but this was every bit the reboot that was given to ‘Evil Dead’ and ‘Friday the 13th’, though on a much smaller scale. Like those, this movie tried its best to be a sequel/reboot hybrid, and it just fell short. Fans of Chucky will no doubt give this a try, even if just for those fun 20-30 minutes towards the end, but many will begin to wonder when it will be time to finally put their Good Guy to rest.